When I was much younger and just beginning to cook for myself, I tried making soup several times and completely failed. My strategy was to dump some vegetables and meat in a pot, add water and cook. The soup was flavorless and often not very attractive. I gave up for a while and relied on canned soups to satisfy my craving for warm, comfort food. There are some decent prepared soups out there, but I don’t think any of them come in a can, and most of them rely on sodium to boost their flavor, making them questionable as a healthy food. It wasn’t until I started making my own chicken stock that I realized much of what I was doing wrong. Rather than layering flavors and preparing vegetables to bring out their best, I was just boiling the life out of everything. 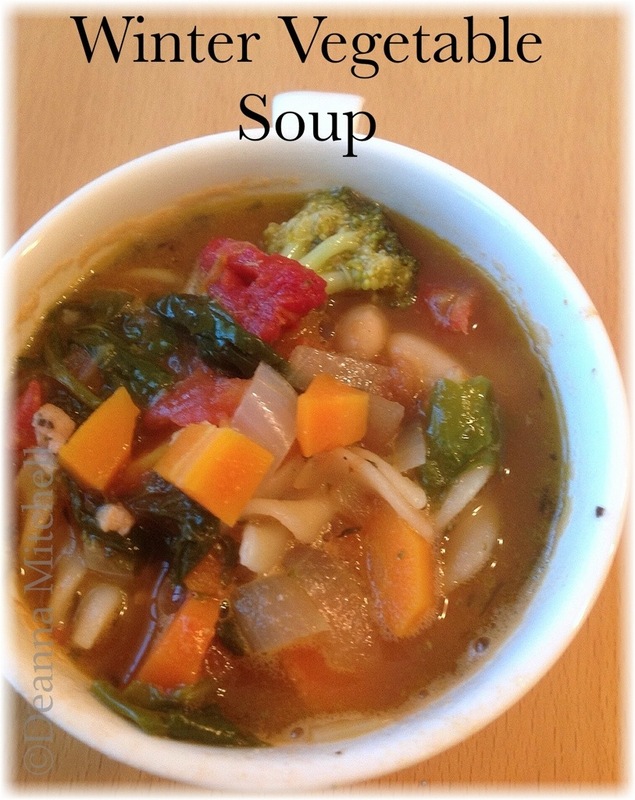 This soup started with Ina Garten’s Winter Minestrone recipe, but I altered it to make use of what I had on hand. It is very easy and although it takes more time than the “dump and stir” method of my past, the time is infinitely worth it. You can change this up yourself to make use of what you have in your refrigerator or pantry. If you froze some pesto from the summer, this is a great time to use it! This recipe makes quite a lot, so either prepare to freeze some or invite some friends over! Heat the olive oil over medium heat in a Dutch oven or stock pot. Add the pancetta and cook about 5 minutes or until nicely browned. Stir frequently to keep the pancetta from sticking. Add the onion, garlic, carrot, celery, squash, sweet potato, broccoli and thyme to the pot. Stir well and cook about 10 minutes or until the vegetables begin to soften. Add all the remaining ingredients and simmer, covered for 30 minutes. Check seasonings and correct if necessary with salt and pepper. Uncover, stir well and add more liquid (either stock or water) if the soup is too thick. Simmer uncovered for another 30 minutes. Remove the rosemary sprigs. Serve immediately with a nice, hearty bread or green salad. Going to need this recipe this week. Going down into the 20’s tomorrow night. Here, too 😦 Definitely soup weather!